When you’re in locations that require several layers of clothing to keep warm, you will want to keep in mind that the article of clothing you wear on top of your skin is probably the most important one. The choice of a good base layer can tip the scales between comfort and unease throughout the day. In worst case scenarios, having the best base layer will allow you to function longer under adverse conditions. Now there are a number of considerations you will want to keep in mind when picking out a base layer for your next trip. You will want to consider size, fit and material among other things when picking one out. These factors will affect insulation, moisture wicking, and comfort. So it’s not as simple as picking out your favorite brand. 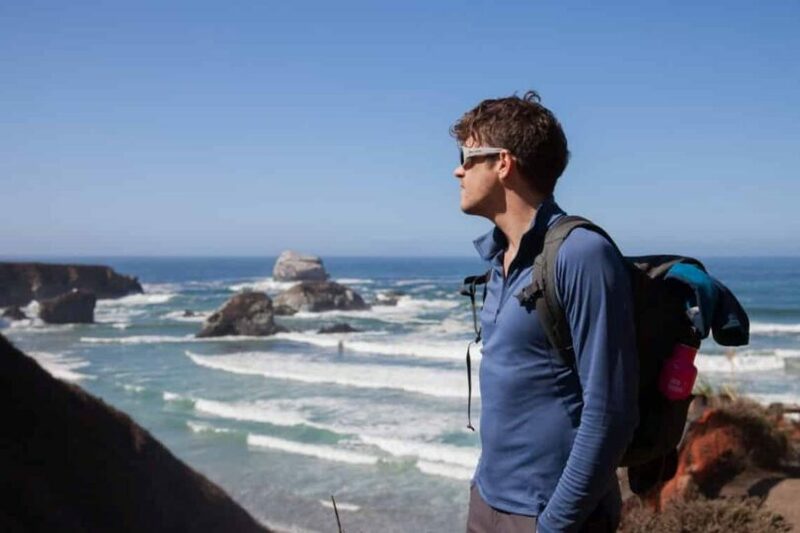 Your base layer can actually make or break your experience while outdoors. 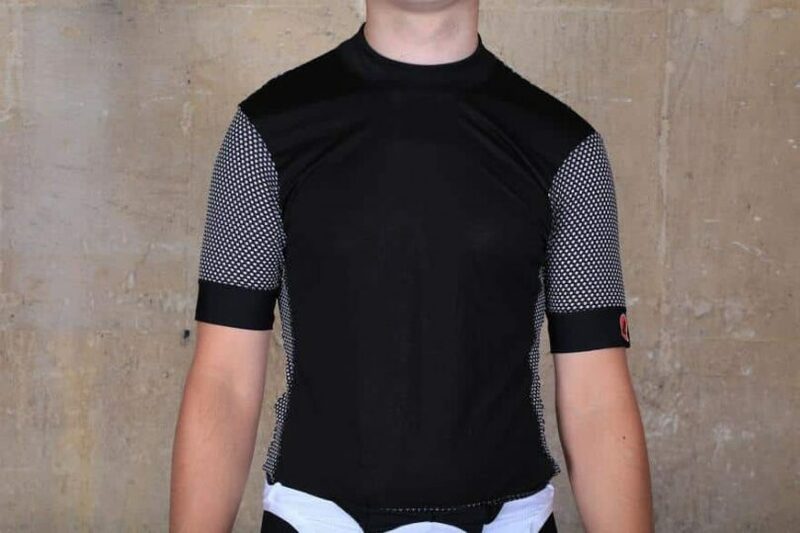 So here are what you will want to decide on as you choose your base layer. One of the first things that you have to understand about a base layer is the fact that the fit has to be right in order for its properties to work. For one thing, if you expect the base layer to be able to wick moisture away from your body, it has to be against the skin. This means that you will need a layer that fits snugly. Loose portions may become portions where sweat can accumulate. The only exception to the snug fit rule is when you’re using a base layer as the only clothing you’re wearing. 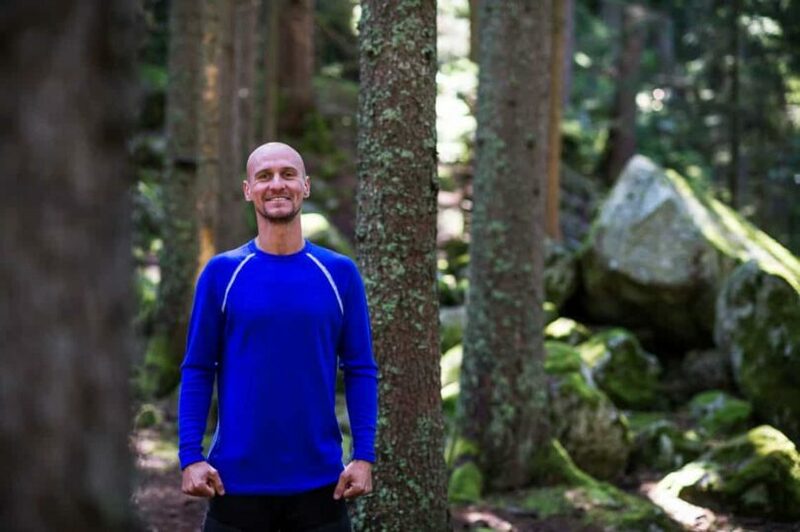 Some folks like using base layers when they go on runs or hikes in warmer weather. In this case, you would want something a bit more loose-fitting as you want a bit more air flow in warmer temperatures. It’s already been mentioned to some extent above. Wicking refers to the ability of a fabric to draw sweat away from the body. This is then pushed towards outer layers where it can evaporate while not directly on you. Sweat that sticks around the body only works to keep you colder, and it’s a great way to develop bad odors. It’s important to have a base layer that is comprised of components that have moisture wicking capacity. Other than being bad for maintaining the ideal temperature, components that absorb sweat will also weigh you down more. This can be a problem if you’re going on a long hike. When you’re out during winter time, everything that you have to do is much more difficult than if it were under regular temperatures. It’s important to find a base layer that offers the highest amount of insulation, especially when you’re using it in extremely cold conditions. There are exceptions, again this is when you also want to use that base layer in warmer climates. A good base layer will be able to serve you during winter and in warmer weather as well. This is because the moisture wicking properties of a base layer when paired with a slightly more loose fitting layer allow for good air movement and a cooler body temperature. This refers to the thickness of the fabric, and by extension also plays a role on how effective it is at moisture wicking and at insulating your body’s heat. They generally come in three weights: lightweight, middleweight, and heavyweight. Lightweight – this refers to base layers that are the thinnest. These are the most effective in terms of moisture wicking. With that in mind, this is the base layer of choice for a number of outdoor athletes, as the intense amount of physical exertion that their sports require will lead them to sweat a lot. Some athletes use this underneath a heavyweight base layer. Alternatively, this is probably the best layer weight to use if you intend to use this in warmer climates. The optimal level of moisture wicking and thin fabric of the layer make it a great option in terms of promoting good airflow to keep you cool on grueling runs under hot weather. 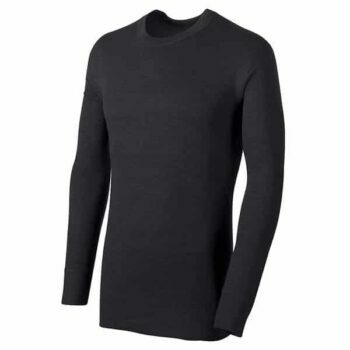 Middleweight – These base layers usually serve as the next-to-skin layer of choice for a lot of folks who work and live in cold temperatures. These layers are able to provide a good balance of moisture wicking capacity and a better level of insulation than lightweight layers because of their increased thickness. These can also be used as a second layer to the lightweight layers. Overall it’s great for moderate levels of physical activity. Heavyweight – As the name implies, this is the heaviest among the three base layer weights. They are built with the coldest conditions in mind, hence they will have the best insulation among the three. This is not typically worn as the first layer as its wicking capacity is less than the two previously mentioned. Usually, it’s worn over a lightweight or middleweight base layer. These types of base layers will commonly fit loosely around the body. Synthetic – These are commonly constructed of nylon and/or polyester blends. These are great for layers that fit snugly onto skin and they are great for wicking moisture. The material is also resistant to wrinkling and abrasion. These are pretty easy to care for and dry quickly. They are elastic and can still be worn if your body weight fluctuates a little bit. These types of layers, however, have their downsides. 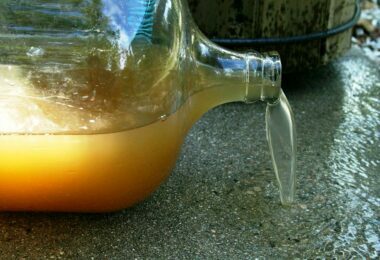 They often smell bad unless you use special treatment solutions and they can hold onto stains. Insulation isn’t that good either. Wool – Traditional wools are generally no longer in use. However, many top-of-the-line brands utilize merino wool, which is unique for its soft fibers. Unlike synthetics, these layers place a greater emphasis on insulation. However, that is not to say that its wicking ability is bad. Merino wool is actually good at wicking sweat away from the body. The material can hold up to 30% of its weight in sweat before it touches skin. Also, even while holding a lot of sweat merino wool is breathable and offers resistance to the development of odors because of natural anti-bacterial properties of the fabric. The main downside to wool is that these can shrink if you aren’t careful when washing. It’s also typically slow to dry, and pretty pricey. Silk – These materials are known for their softness and provide unrivaled texture that feels great on the skin. It isn’t naturally known for wicking but chemical treatment allows it to achieve this effect anyway. These types of fabric are prone to abrasions and require a bit of maintenance when washing. In terms of durability, it doesn’t do well against other fabric types either. Bamboo – This material has started becoming more common in recent years, usually used in conjunction with synthetic materials. 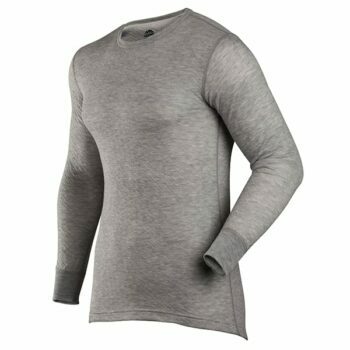 This provides a great deal of toughness and decent moisture wicking. Layers that use Bamboo are usually tight fitting. Here are some fast-selling base-layers online that you might want to think about buying for your next outdoor trip. 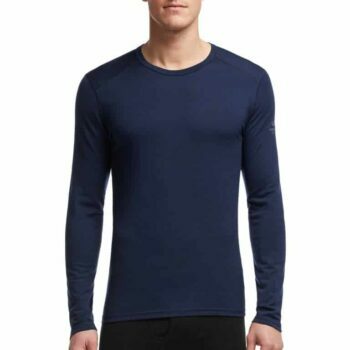 The Smartwool Men’s 250 Zip Top is a great option for anyone looking for a middleweight base layer. Being made from 100% Merino Wool, it offers excellent insulation, keeping you warm whether just sitting down or when you’re busy with outdoor tasks. The fabric offers a good level of moisture wicking, coupled with the natural anti-bacterial properties offered by wool, and you have a base layer that doesn’t end up smelly funky after several days on the trail. It comes with a flatlock seam system that eliminates chafing. This is definitely a plus for anyone who wants to use this on a hike over several days. The wear and tear of an extended hike can lead to chafing if you’re wearing low-quality synthetic layers. Not the case for the NTS mid 250. The layer’s shoulder panels create a much sturdier construction around the shoulders where a lot of wear and tear tends to happen. It also comes with a 10” front zipper with Interlock Fit which helps with aesthetics and can help you better control the amount of heat your body feels when wearing the layer. Overall, this is a fine option worth considering if you’re in the market for a Merino Wool base layer. 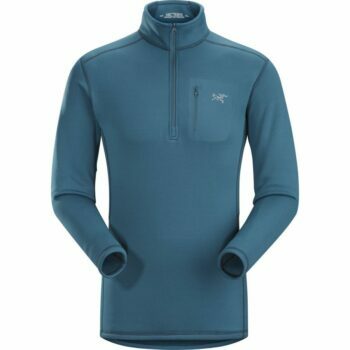 The Arcteryx Zip Neck is a Synthetic-based layer that is definitely worth a gander. Firstly it’s made of a blend of Polartec Power Stretch, which is a blend of 90% polyester and 10% elastane. The blend of synthetic materials coupled with the flatlock construction provides this layer with a great level of moisture wicking capability. And while the synthetic material may turn off some diehard wool loyalists, but the Arcteryx Rho is able to hold its own in terms of insulation. The flatlock construction keeps the shirt to your skin making it far better at retaining body heat. 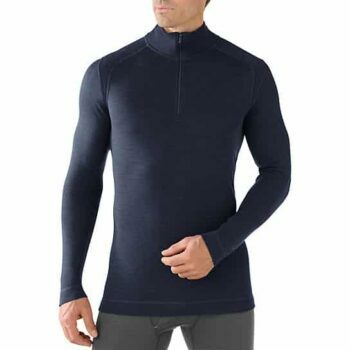 While it is able to handle the stresses that are demanded of a good base layer, the Arcteryx, is like other synthetic base layers. This is in the fact that it is going to require a bit of effort to maintain. Stuffing it into a dryer and mistakenly using fabric conditioner on it will give you a bad time. 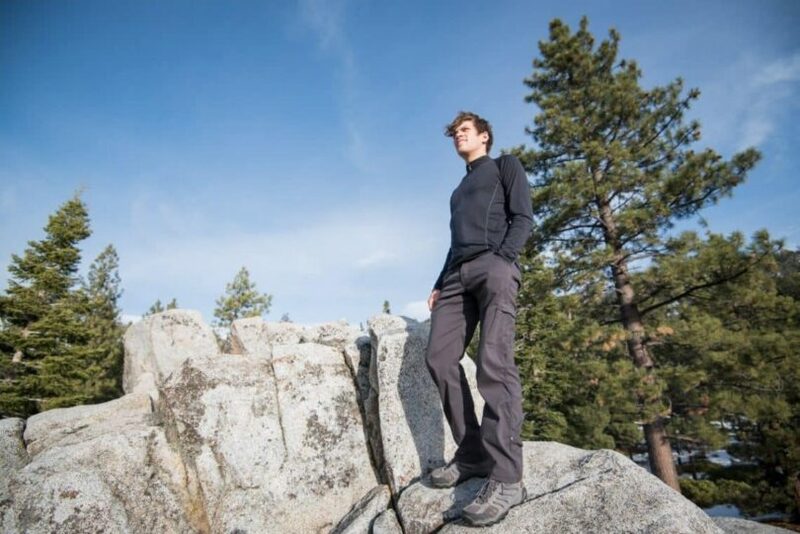 If you’re a wool fan or are intending to get your first base layer, trying out a synthetic base layer, then the Arcteryx RHO AR is definitely a good place to start. 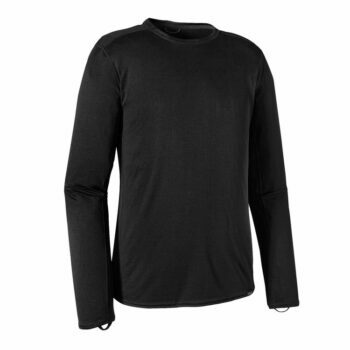 Icebreaker Oasis Long Sleeve is another base layer that provides a great deal of value. Its fabric is primarily Merino Wool. That being said, this top comes with all the benefits commonly attributed to Merino Wool. It’s light weight, it offers a good level of moisture wicking, and a decent level of insulation as well. As with other Merino wool offerings, it doesn’t smell bad too, which is great. And while it offers a great deal of value, it tries to do something that synthetic base layers do very well, and that’s to provide a snug fit on the wearer’s body. While it might work for some, the layer can prove to be too small for some folks as their sizes are smaller relative to competing brands. All of that considered it’s still a great base layer. Though you will probably want to order one size up, otherwise you might find yourself pulling this down more than you’d like while you’re wearing it. tasc Performance Base Layer provides a great alternative to more skeptical folks out there who are particular to Merino Wool. The base layer by Tasc is primarily bamboo, which might be a bit of a new concept to some people. But it actually does pretty well, depending on your needs. The primarily-viscose base coupled with the spandex give the top a pretty snug fit. This coupled with the natural insulation provided by the Merino Wool and Viscose provide the wearer with a more than sufficient defense against the cold. The snugness provides a good level of wicking as well. These materials also make it resistant to odors that have a tendency to stick onto clothes. Also since it’s a middleweight layer, it can be worn as the bottom layer or with something underneath. The versatility this provides gives the buyer a great deal of value for their purchase. Patagonia Capilene Crew Top shirt is a great shirt for layering. It boasts a construction based on Polartec Power Grid which provides it a smooth face which is great for ease of layering. On the inside, the fabric has a brushed-grid pattern making it very comfortable for the wearer. They also included shoulder seams that have a bit of offset in order to compensate for having to carry a pack all the time. This reinforces the shoulder and minimizes chances of damage at the seams. Underarm gussets help minimize chafing under the straps of backpacks. The flatlock fit of the layer helps lessen chafing. The shirt does require a bit of care. The synthetic material, if not cared for can lead to the development of bad odors, especially if used for strenuous activity. ColdPruf Men’s Basic Dual Top has a large percentage of its construction is cotton. The material is very much soft to the touch, and is comfortable. However, it does have its disadvantages. Cotton in general will absorb moisture. This means that the rate at which moisture can be wicked off or the rate at which it dries is a bit slower than other shirts. That being said, however, the top by ColdPruf still functions well as a base layer. Due to ColdPruf’s Thermachioce system, it shines when used in moderate to cold temperatures, especially in conditions where heavy exertion is not required. The blend of cotton and polyester provide a fantastic level of body heat retention. The key to using this top comfortably is making sure you do so in conditions where you will not be sweating heavily. If you keep that in mind then you will be fine. Duofold’s Men’s Wicking Top is a great multi-purpose everyday top. It provides a decent level of moisture wicking and a double layer thermal material for added warmth. The flatlock seam construction helps in providing the wearer with a great fit that defies the tendency to tear brought about by heavy use. The cotton construction provides an excellent degree of comfort while the polyester provides the much-needed elasticity and insulation required for a base layer. This top by Duofold is great for light to medium amounts of physical activity. When worn under a good layer, it will keep you warm. However, if your body is pushed enough to sweat, the cotton will hold on to the moisture making evaporation and wicking at low levels. 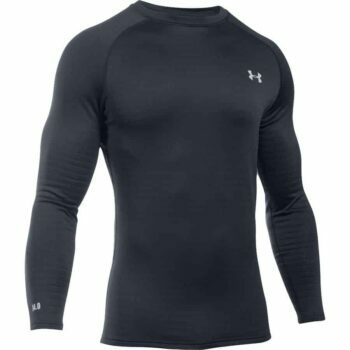 Under Armour’s 4.0 Crew is a great top for doing a high-intensity physical activity, even when in the cold. The synthetic polyester and elastane blend provide a high level of sweat wicking ability which is very important for athletes. 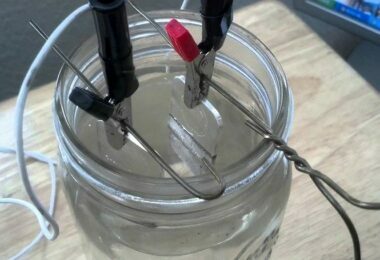 The moisture wicking capacity is especially important in low temperatures. The synthetic make, coupled with the layer weight also pull it close to the body. This allows it to trap body heat quite well. Though if you’re working in very cold temperatures, you will definitely have to wear some good layers over this. The top might not be able to fully fight the cold as its insulation ability can leave a bit to be desired when faced with low temperatures. Overall this offering by Under Armour provides a high level of performance that is great for athletes. It will work well enough in the cold for light to moderate bits of activity but probably won’t stack up well against Merino wool layers under those conditions. There you have it. 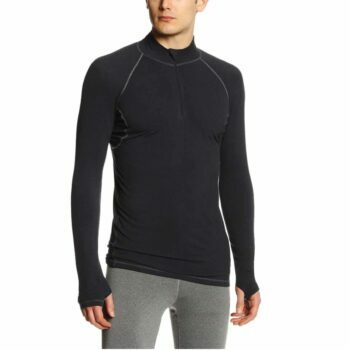 Choosing the right base layer may take a bit of thinking with regard to your needs. But it isn’t that tough. 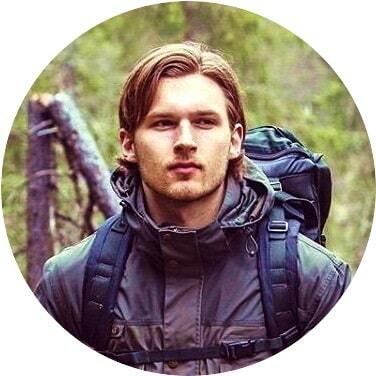 But be sure to think it through because you don’t want to be spending your next hike up a cold mountain regretting your choice of base layers.